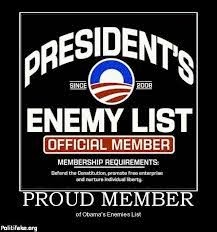 What Do You Have to Do to Get on President Obama’s “Enemies List”? #2 Steve H.: ...Ask any dictator overseas – SO WHAT if Obama thinks badly of you? What is he going to do – whine louder? cancel your birthday? make you eat a school lunch? FormerHostage, Nucking Futs and tinman!